I played at La Jolla High School from 1972 to 1974. I played #1 singles. We had great teams, went undefeated in league play and were city champs. I loved being part of a team and the girls were great fun! Graduating early from high school, I went on to play as the first woman on a men’s team, at San Diego City College, under coach Robert Bacon. 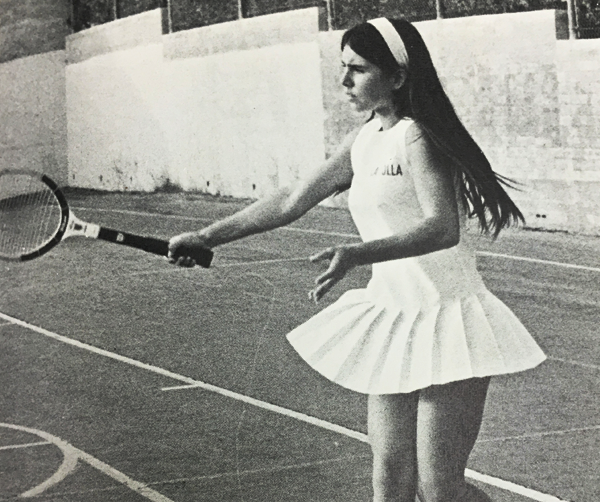 We won the State Title for junior colleges, at Ojai and I won the Women’s Singles.From 1974-78, I played on the pro tour, playing the French, Wimbledon,US Open and numerous other tournaments. I continue to play to this day in the “Senior” divisions. I’ve had the good fortune of winning several National Doubles titles on grass, clay and hard court surfaces and also hold two ITF World Cup Team titles and two Currently, I live in Scripps Ranch where I have been the Tennis Director/ Head Pro at Scripps Ranch Swim & Racket Club since 1987. I am the proud mother of two children and four grandchildren, whom I enjoy spending time with when I’m not on the court!